Will this bass have us running to the hills or shouting Holy Smoke? A very fine Precision at a very good price. Enjoy! Have a back brace on order. Despite their huge body of work, one constant throughout the veteran British metal band Iron Maiden’s story has been Steve Harris’s bass playing - the linchpin of the band’s sound in many respects. Steve’s no-nonsense approach to music, and bass playing in particular, has seen him rely on Precision basses for many years, and it’s not surprising that Fender duly created a signature model for him. 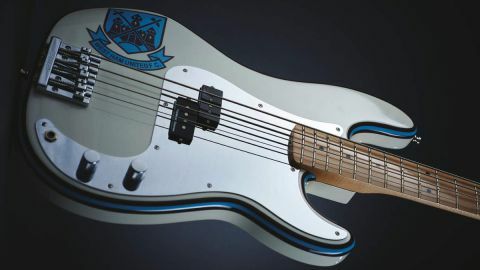 Our review model is the second iteration of the Harris Precision, swapping the original blue finish for a gloss white with eye-catching maroon and blue pinstriping in the colours of his beloved West Ham United, capped off with the club’s crest. At over five kilos in weight, this bass is no lightweight. Do its performance and tone justify the excessive poundage? Let’s find out! From the moment you pick it up, you know this bass means business. Its weight is noticeable from the start, of course, but on the plus side, this is a solid instrument. Feel free to get stuck into this bass; you won’t break it! The standard Precision design, body shape and dimensions are instantly familiar, so sleekness isn’t necessarily a feature, but for a player like Steve it doesn’t need to be. The hefty maple two-piece body is coated with a gloss white polyester finish, while the U-shaped maple neck and matching maple fingerboard twinkle due to the gloss urethane finish. Despite the fully shaped neck, it doesn’t feel quite as stocky as Green Day bassist Mike Dirnt’s equivalent signature Precision, and in terms of playability, this bass certainly isn’t lacking. The rolled fingerboard edges add a level of comfort, while the 19mm string spacing and 41mm nut width give the player some room to dig in. Black dot position markers have been used on the front and side of the neck, and stand out against the light colouring of the maple fingerboard. A darker lacquer has been applied to the headstock to give a slight vintage vibe, while the mirror scratchplate and the signature on the rear of the headstock make it clear whose bass this is. Although the Precision comes fitted with heavy gauge nickel roundwounds, a set of Steve’s signature Rotosound flatwounds are included in the package. Chrome Fender hardware has been used throughout, all of which does a fine job, is sturdily attached and operates smoothly, while the signature Seymour Duncan SPB-4 split-coil pickup works very well in the context of this passive bass. There’s a lot of clarity to the acoustic tone, and a substantial amount of sustain, so it’s not surprising that once plugged in, the bass’s output is powerful, thick and throaty. As with most Precision-style instruments, a single control dictates the amount of light and shade in your tone. Sure, Steve’s signature tone may not be suitable for all types of music; his gritty, rasping sound is certainly there but a fat, rounded thump is also possible, as are variations in between - so don’t be under the impression that this is a one-trick pony. Despite the significant weight, there is minimal headstock bias and when placed on a strap, the bass balances very nicely indeed. You may find, like Steve, that a padded strap is a necessity, but the bass sits very well against the player’s body and its playability is not affected by the weight. It’s just a case of whether your shoulders and back can sustain the burden. The glossy neck doesn’t hinder the player in any way; Steve has never been a slouch where his bass playing is concerned so if it works for him, so be it. It is evident that Fender has gone to town on this model to create a very pleasing playing experience. This is a fine bass, with the only negative aspect being the significant weight issue, although that same weight contributes significantly to the thick, rich tone. The sum of the parts is very pleasing, and although the visuals won’t work for every player, sonically this is an impressive bass. Rock and metal players will love it, of course; maybe you owe it to yourself to check one of these basses out.